What is Home Affordable Modification Program? In 2009, the government created the Home Affordable Modification Program (HAMP), which is part of the government’s Making Home Affordable Program designed to provide relief for troubled homeowners. HAMP helps troubled homeowners by reducing their mortgage payments so that these payments are 31 percent of their pre-tax monthly income. Not all lenders participate in HAMP, but you may be able to work out a loan modification with them nonetheless. This program ends on December 31, 2016. Therefore the time to act is now! How does a borrower qualify for and obtain a loan modification? • Have enough documented income that you could pay your mortgage if it was modified. • Have financial hardship and this are delinquent or in “serious” financial hardship such as a loss in income, illness or a divorce that puts them at risk of defaulting on their mortgage. They must prove this hardship with documentation and sign an affidavit to that effect. Homeowners will likely need to provide the following documents to lenders to be considered for a loan modification: income documentation such as recent pay stubs; tax returns; a list of assets and their estimated values; credit card and loan statements; and a letter outlining the financial hardship they face. Once they have gathered that information, borrowers should call their mortgage bank and ask for a loan modification. What is the effect of a loan modification on my credit? Those participating in HAMP probably won’t see a dip in their credit score, as government has set up requirements that lenders report HAMP in such a way it doesn’t currently your credit score. However, there is no guarantee that a loan modification in general won’t impact your credit score. 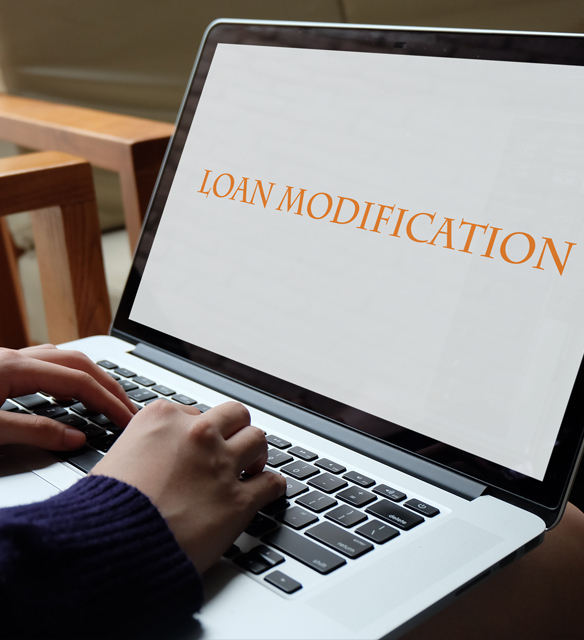 What are the alternatives to a loan modification? If you don’t qualify for a loan modification, but can’t make your mortgage payments, you have other options to avoid foreclosure. • Short selling the home, whereby you and the bank negotiate a deal allowing you to sell your home for less than you currently owe the bank. • Finding a tenant who will rent your home and use that money to repay the lender. Our firm will explain each option and depending on your individual circumstances, the information you obtain will empower you to make an educated decision for you and your family. Meanwhile allowing you to move in a way that is financially beneficial to you. We will discuss all your options and aggressively pursue a defense strategy that works best for you. • Examine relevant legal documents such as the terms and conditions of your Loan Documents. • Communicate directly with your lender’s legal department. • Negotiate with your lender the modification of your mortgage. • Defend your foreclosure by asserting all applicable defenses. • Negotiate a Deed-in-Lieu of Foreclosure. • Assist with the filing of a bankruptcy. The information obtained on this site is not, nor intended to be legal advice. You should consult an attorney for individual advice regarding your case. Copyright © 2015 J&A LAW OFFICE, PLLC. Theme by WPCharming.